ACOUSTIC EXPO 2014: In our first two Jon Gomm video lessons, we scrutinised his rhythm work to learn how he slaps, taps, scratches and scrapes his road-worn but trusty Lowden acoustic guitar to create drum parts and layers of harmony, achieving multitasking mastery. In this instalment, we look at his approach to fingerstyle. Jon has amassed a following through sheer graft (like many players, he began by plying his trade on the UK open-mic scene), and has since appeared all over the globe. A handy retweet from none other than Stephen Fry helped a video of his song Passionflower go viral, and he's even enjoyed the unlikely privilege of appearing on BBC One Breakfast. In a world where some remain cynical about percussive guitar playing, Jon Gomm stands out as not only a wonderfully creative player, but also a talented songwriter and learned scholar of music. Never one to do things the easy way, Jon effortlessly combines fingerstyle with percussion. He humbly insists he isn't the fastest fingerpicker on the block (we don't believe him! 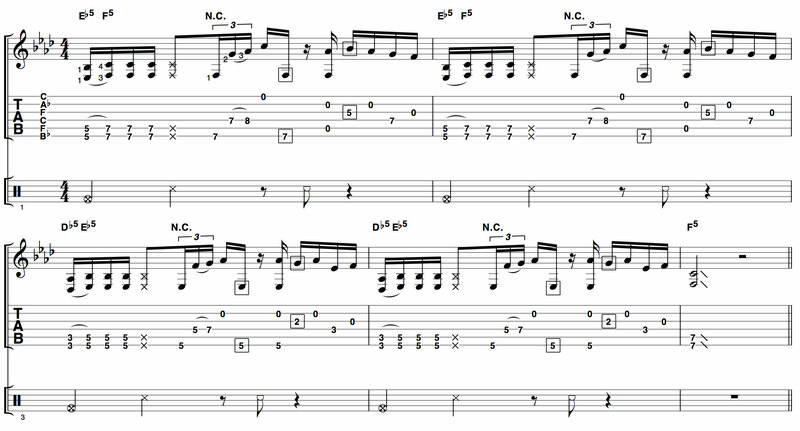 ), and because of this, he plays a lot of fret-hand taps, which require accuracy and force to sound clearly. An advantageous by-product is that his pick hand is spared, should a percussive sound be needed. Speaking of the pick hand, he often likes to follow a muted strum with a flick of the guitar's top in the same motion, rather like a flamenco player might. We're presenting Jon's percussive strikes on an extra stave underneath the usual notation and tab you'd find in our standard transcriptions. Spend a little while familiarising yourself with these symbols and the techniques they represent. Remember, all the symbols refer to individual drums of a drum kit. Jon begins this pattern with a two-note chord played as a downstroke with his fingernails; that's followed by a hammer-on, an upstroke played this time with his thumb and, finally, a flamenco-style downstroke using his nails. This is just a short section of Jon's improv, but these techniques add a lot, tonally speaking. Acoustic sensation Jon Gomm and his companion "Wilma" (from the Lowden Original Series) are both dear friends of us here at Lowden. We're proud that Jon has chosen Lowden and delighted to see him featured in this year's Acoustic Expo. This year Jon is featuring as both a judge and as a prize in the first ever Lowden Young Guitarist of the Year competition (click the link to see Jon discussing the competition). The Lowden ʻO,' sought after for its bass and overtones, is well suited to Jon's innovative style and has traditionally been the preferred choice for fingerstyle and open tuning. It has a deep and resonant tone. Lowden Guitars are hand-built in Downpatrick, Northern Ireland by a dedicated team of craftsmen that includes George Lowden and his two sons. George designed and hand built the first ever Lowden in 1974, and four decades later every Lowden guitar is still shaped and voiced by hand from the finest materials to exacting specifications. Visit the Lowden booth at the Acoustic Expo for more about the Lowden Original Series, Fan Fret, and Thomas Leeb Signature model.